Twenty years ago as a freshman in high school I became a writer for my school’s newspaper despite the fact that freshman weren’t allowed to be a part of the class. Looking back I probably should have taken shop anyway so that I wouldn’t be paying other people to do odd jobs around the house. Anyway… One of the articles I wrote was an op-ed piece in response to Charles Barkley’s proclamation in the latest Nike commercial that he “is not a role model. Later that summer after the school year was over Mike Royko of the Ann Arbor News wrote an op-ed piece on it as well which my news paper teacher sent me to encourage me to keep writing. Mr. Royko and I had the same opinion. We agreed with the overriding message of the commercial, “Parent’s should be role models. 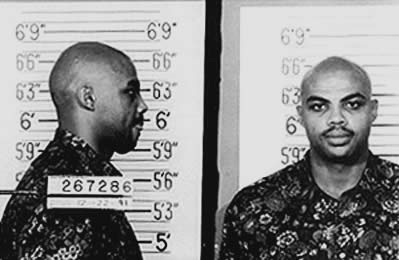 Just because I can dunk a basketball doesn’t mean I should raise your kids.” While neither of us condoned of his throwing a guy through a window at a bar fight (thus the mugshot above), or missing the adult he was aiming for and ‘accidentally’ spitting on a kid sitting courtside instead at one his basketball games Barkley is right. “Why,” you ask am I bringing up two decades old commercials and news articles? Last week when Miley Cyrus performed her song “We Can’t Stop” live at the MTV VMAs. There was a deluge of news and social media response to her antics, most of it lamenting her transformation from teenage Disney Star, portraying the very likable and admirable fictional character Hannah Montana, into the twenty year old performer portraying, singing about and portraying a morally reckless lifestyle of uninhibited sexuality, drug and alcohol abuse. Many of the responses centered around her apparent rejection and descent from being a role model into one of those kind of girls you shouldn’t be within a hundred feet of. Now that I’ve had time to think about it, and time to write about it, I have two prevailing thoughts. Not to defend or excuse Miley’s performance but it was obvious to me that very few people, at least those saddened by her apparent turn, had actually listened to the lyrics of the song or saw the video to the song. If they had, her performance wouldn’t have been so surprising. Her live performance was pretty much a live version of the music video where she did all the same stuff. Goes to show you, if there is one thing MTV doesn’t do much of it is show music videos. Secondly, and more importantly, the hullubaloo brought me back to what Charles Barkley said in that Nike commercial twenty years ago, “Parents should be role models.” There is no denying that public figures and famous people have influence, but we are the ones to be pitied if we continue to promote (even if it be unintentionally) the belief that their influence can even hold a candle next to the overwhelming influence of private figures. The number one private influence in the life of children and young people is their parents. Even if the parents fail to be positive role models someone else who children and young people can have face-time with have immeasurably more influence than all the famous people they have screen-time with. Twenty years later as a youth pastor and a parent I couldn’t agree with Charles Barkley more. Instead of questioning Miley Cyrus or more importantly the latest version of her ten years from now when my daughter will be less than a year away from being a teenager I’m questioning myself. Am I going to be the kind of role model to my daughter that will make the exploits, good bad ugly and in between, of the latest teen celebrity turned young adult vixen inconsequential to the kind of person she is becoming and aspires to be? I want my daughter to think of myself, and her mother as her role model. I desire that there would be other adults she knows personally who can also serve as excellent examples. As a Christian my parents were role models to me because they were doing their best to be followers of the model Jesus laid forth. They weren’t perfect, but they pointed me in the direction of the one who is. They couldn’t provide unshakable security through life, but they pointed me towards the one in whom life is found. My parents were role models by simply doing their best to model their life after Jesus. My wife and I won’t be perfect role models either, and we’ll make mistakes, but our influence in our daughter’s life will far outweigh the influence of any celebrity or famous person, ever. Even if we somehow became best friends with one spending lots of time with them we still have the primary job of being role models to our daughter. As an adult I understand more than ever that life is not found in the life of celebrities and famous people. There are plenty of athletes who I enjoy watching compete and entertainers perform act and sing. I have no expectation that these individuals behave in a way that would suggest that they have trusted their life to Christ and are being shaped morally by him when they’ve made no proclamation of allegiance to Jesus. Even if they did the likelihood that our young people are going to rub shoulders with them on a regular weekly or daily basis is exponentially unlikely. Nowhere in their contract is it written that they are to be role models for our kids. However, we are bound to our children by something that transcends written agreements with performance clauses. We should be very wary of giving that tremendous responsibility and privilege to flesh and blood people who do little more than flash across our many various screens. Especially a twenty year old girl who could probably have benefitted from one herself instead of being thrust into the position of role model at the age most of us are yearning for our parents and other adults to show us what it means and looks like to be an fully formed adult. Give Miley and all the other famous people a break and let’s do our job.